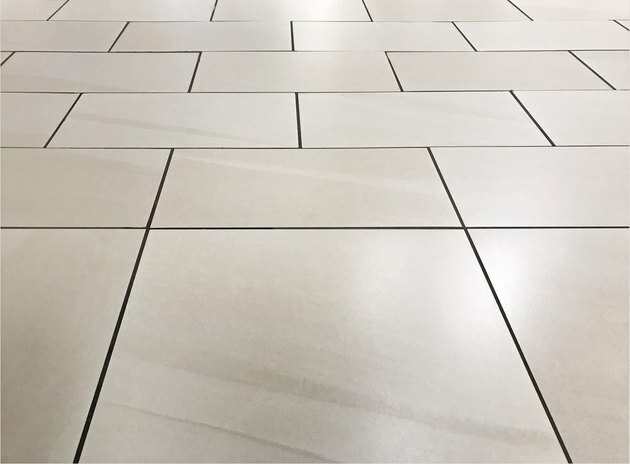 When you are putting in a new tile floor, expense is almost always a consideration, but durability counts too, and inexpensive tile that breaks easily can cost you more than tough tile in the long run. The most popular choices for home tile are ceramic porcelain and ceramic nonporcelain, but there are many different types of floor coverings. Some homeowners opt for stone, vinyl, wood or laminate tile instead. All of these materials are meant to be fairly durable, but the quality of the product will have some effect on how long each type of tile lasts. It's easy to think of ceramic and porcelain tile as two distinctly different types, but the relationship between the two is more complicated than that. Ceramic tile includes any type of tile that is made entirely or partially from clay and is kiln-fired. This means that porcelain tile is a type of ceramic tile too. It's easier to think of ceramic tile as either porcelain ceramic or nonporcelain ceramic. While nonporcelain ceramic tile is typically called ceramic tile, it is porcelain ceramic tiles that are stronger, denser and more attractive. Many ceramic tiles are wear-rated for hardness and carry a Porcelain Enamel Institute, or PEI, hardiness rating. This will give you the specifics of the hardiness of any ceramic tile you are buying. Nonporcelain tiles (also known as ceramic tiles) are made from clay fired in a kiln. Many are finished with a glaze, although some, like terra cotta, are not glazed. They usually carry a PEI rating of zero to three, meaning that they are relatively soft, easy to cut and easier to chip than porcelain tile. At their strongest, they only work well for moderate foot traffic. Porcelain tile is also made from clay, but it is usually fired at higher temperatures and made from a method called dust-pressing. This makes porcelain tile denser, harder to stain and more durable than nonporcelain ceramic tile. They absorb water much less than nonporcelain tile, so they can be used indoors or outdoors. Because they are so much harder than nonporcelain tile, they are harder to cut. They are also very strong floor tiles, absorbing more wear and better resisting damage. Their PEI rating of three to six qualifies them for any type of foot traffic, even heavy commercial traffic. They are also more expensive than nonporcelain tile. Porcelain tile is stronger than poured tiles like cement or brick. Wooden tiles and wood laminate tiles do not even come close to the durability of porcelain. Natural stone tile is very attractive and can also be strong as well. Common types of stone flooring include slate, marble, granite, limestone and travertine. Note that the qualities of natural stone tile vary enormously depending on where, how and when the stone was quarried. There are two types of natural stone tile that are extremely strong and hard-wearing. In fact, either could qualify as a contender for the best tile for kitchen floors and/or other high-traffic locations. One is granite, a dense, hard igneous rock. It is a distinctive flooring, offering a speckled appearance from the minerals found within the rock. It is said to be close to impervious and, once polished, it resists scratching. The other extremely durable natural stone tile is slate. This stone is a dense metamorphic rock that is very durable. The surface of slate tile is naturally textured, although you can find some that have been smoothed and honed. You can find slate in a variety of dark earth tones.